On July 31, 2018, Steve Tribble completed the sale of Tribble Electric to a private investor. Terms of the transaction were not disclosed. 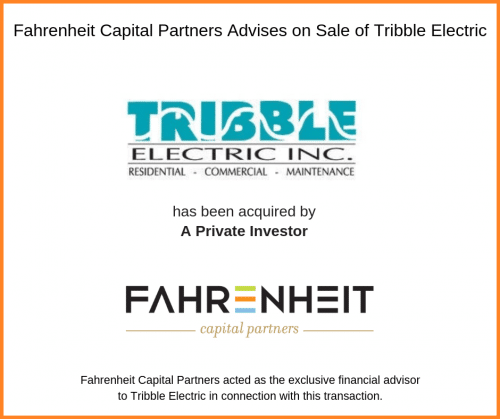 Jonathan Brabrand, Managing Director at Fahrenheit Capital Partners, represented Tribble Electric in the sale. Steve Tribble founded Tribble Electric in 1983 and as CEO led the company to become a premier full-service electrical contractor in the Richmond area. Operating from its headquarters on Richmond’s Northside, the company provides a full complement of commercial, multi-family, maintenance, low voltage, and residential services to a range of customers located throughout Central Virginia. “This transaction represents a very important milestone in Tribble Electric’s history,” Jonathan noted. “With this ownership transition, the Tribble family has secured the legacy of their company and has ensured that it will continue its history of success in perpetuity.” He added that it will remain business as usual at Tribble Electric going forward, as all employees (including Steve and wife Dody Tribble) will remain with the company and the new owner is committed to supporting Tribble Electric’s continued growth and expansion. Fahrenheit Capital Partners provides exceptional M&A advisory services to lower middle market clients located throughout the U.S. We have a particular focus on advising family and closely held businesses, offering clear guidance at every stage of the process to ensure the best possible outcome for what is usually the culminating financial event in the life of a business owner and their family. Our services include Sell-Side M&A Preparation & Advisory, Capital Raising, Buy-Side M&A Advisory, and Post-Closing Settlement & Transition. The above testimonial may not be representative of the experience of other clients and should not be construed as a guarantee of future performance or success. This press release is for informational purposes only and does not constitute an offer, invitation or recommendation to buy, sell, subscribe for, or issue any securities. While the information provided herein is believed to be accurate and reliable, Fahrenheit Capital Partners and BA Securities, LLC make no representations or warranties, expressed or implied, as to the accuracy or completeness of such information. All information contained herein is preliminary, limited and subject to completion, correction or amendment. It should not be construed as investment, legal, or tax advice and may not be reproduced or distributed to any person. Securities and investment banking services are offered through BA Securities, LLC Member FINRA, SIPC. The Principal of Fahrenheit Capital Partners is a registered representative of BA Securities, LLC. Fahrenheit Capital Partners and BA Securities, LLC are separate and unaffiliated entities.